For an entire year, I ignored a gut feeling. The first time it hit me, I brushed it off as a bad day at work and kept my brain occupied with menial tasks to ignore the menacing voice inside my stomach, telling me things I didn’t want to hear. But the lousy feeling came back a week or so later and I started wondering if I should take it seriously. Still, I wasn’t ready to listen, so I pretended my gut didn’t know what it was talking about and that I was the one in control. After all, my gut wasn’t the one paying my bills. What the scary voice was trying to tell me was that I needed leave my job. For a while there, I thought I had found a place in the world where I could draw and support myself as an artist in a job that was chill. I had money, routine and the freedom to spend excessively. I dedicated my time to retail instead of freelance; I opted for financial comfort instead of pursuing my passion. Before I knew it, I was happy to go through the motions without thinking too much about anything at all. Change became the enemy in my life, and I wanted to avoid it at all costs. Weeks passed, and I became professionally stagnant and spent way too much time thinking about someone else’s business instead of my own. I lost the plot and any ambition to progress myself. But I kept pushing away these thoughts of dissatisfaction with excuses. I could always justify needing more money and didn’t believe I was ready to go freelance again. Looking into my late twenties, I felt less enticed by the idea of changing everything again despite the blatant truth that I wasn’t satisfied with my work or the person I was working for and probably wasn’t being the best employee either. I didn’t want to struggle again, but I also felt stuck and too dependent on a job that wasn’t challenging enough. Slowly but surely, my routine turned on me too. Like an exotic growth in my belly, my intuition became stronger and that tiny gut feeling started to grow bigger: I hated my job, but I loved the money. Nobody wants to say it. I know I didn’t. The job itself was perfectly fine for someone else, but I was tired of doing the same thing every day that was unrelated to my serious career interests. A part of me wanted to be loyal and stick with it, be satisfied for once because I was following the rules like the rest of working-class society. But regardless of my willingness to comply, I couldn’t escape the likelihood that a tragic financial ending was about to take place. Two weeks before my 27th birthday, my employer dumped me. In a series of unfortunate events regarding the whereabouts of a wrongfully sold table, I received a mouthful of troubling accusations from my boss and the abrupt conclusion that it would be best for me never to return to his store again. I didn’t even care to follow up on the destination of the missing table. My lack of interest and my relief of losing this job hit me in a way I hadn’t expected. I was free! And the table (for the lack of being reclaimed) was free too! The interesting part of this story, not involving the table, is this: my gut knew in advance what was going to happen. Heck, my gut knew that the table was going to be part of the reason for my termination! Instead of listening to that uncomfortable feeling telling me to exit with grace, I let the primitive part of my brain convince me to stay simply because it was what I thought I needed. But just like that, my job vanished and I was left with the unflattering reality that I had been brutally dumped by an employer (again). I would also have to avoid the north side of Queen West for an entire year, which can be tough, especially if you’re headed there for brunch on Sunday. I felt like a huge degenerate. 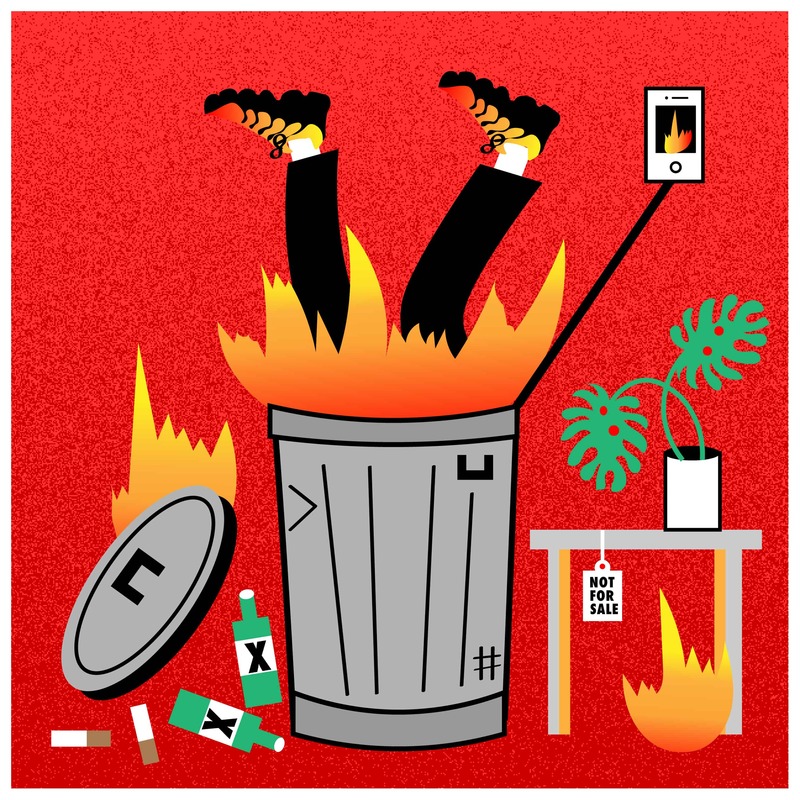 Getting dumped by an employer is worse than getting dumped by a partner because you immediately feel the stinging pain coming from your pockets and the likelihood of your reputation burning in flames. It was a shock to my system, and the emotional trauma gave me chills as I debated what course of action I might take to repair the damage to my ego and find the strength to forget about the table and my ex-employer. I was, in retrospect, a loser. But even as a loser, I believed in myself like I would an underdog boxer, and my determination was stronger after defeat. I had spent too much time comparing myself to peers and convincing myself that change was my enemy. Getting fired was the best thing that could have happened to me because it forced me to see that change isn’t so bad after all. I didn’t cease to exist post-termination. I spent a lot of time fighting with myself over whether or not I’m a good, capable and smart person, and then I rebounded. I reclaimed what power I had left and challenged myself to find the positive side to a really ugly situation: my boss did me a favour by making a hard decision for me. My rational brain had been in direct competition with the feeling in my stomach that was trying to persuade me to do the right thing. I should have been brave and listened to it months ago, but I ignored it.